‘GOATMOB’; Virtual socio-phobes, they are seldom seen at nightclubs, festivals or other communal shindigs. It is believed they spend most of their waking life underground, practising their primitive form of music and imbibing in strange herbs and potions. Emerging from the midst of Melbourne’s underground, the latest production from the illustrious Crate Cartel crew is Goatmob. 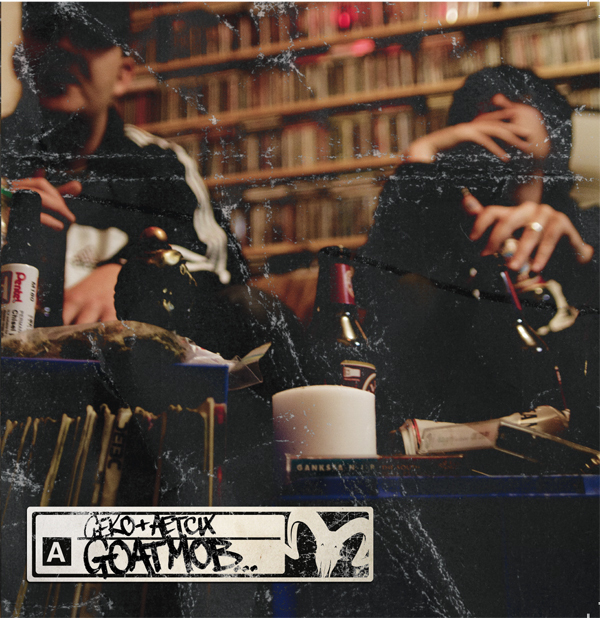 Both emcees and producers respectively, the complimentary alliance that is Geko and Aetcix successfully combine their individual styles to bring this peculiarly alluring project to fruition. Goatmob reunites the duo again after collaborating on previous projects such as 2007’s Raw Four EP and the recent One Fell Swoop EP. In essence, the album is the result of cathartically unconscious writing, steering clear of contrived attempts to cover any particular topics. Though experimental and multifarious musically, the trademark sounds of old-school gritty samples are constant throughout. With guest appearances from Melbourne’s 1/6 (Ilzilla), Fatty Phew, Budsa, as well as fellow Crate Cartellions Fluent Form and Maundz. Verses flow seamlessly to inclusively simulate a casual exchange of bars between cohorts. To observe the apparently effortless versatility of Goatmob, one need only compare the opening and closing tracks Executioners and Empty Bowl; the first an up-tempo, fired-up flavour, and the last a mellowed reggae-style encounter. Next Post Aslan Presentz… Co-Offenderz Twelve Jewelz A.U.S.